When I open a topic, find some red alarm, and blue font with purple background. I think it's the problem of DTD? 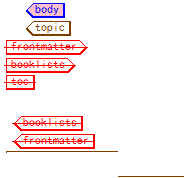 When I open a topic, which DTD I use? How can I check which DTD I used?